This American take on a popular Italian Recipe is another deliciously decadent idea for a Mother’s Day Breakfast or Brunch. Strawberry Bruschetta is such a versatile dish — it can be used as a side dish with breakfast or brunch, an appetizer or even as a quick, low calorie dessert recipe. 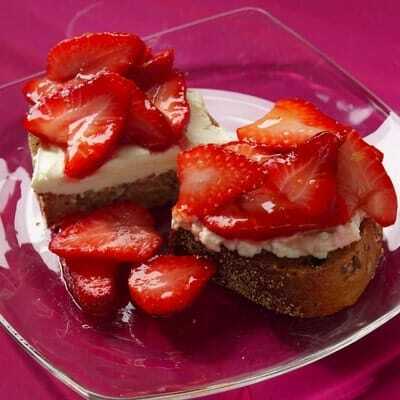 Just by making a few small changes to the traditional strawberry bruschetta that Giada DeLaurentis makes, I was able to get the Points Value to just 5 Points per serving. It’s such an easy and effortless dish to make if you’ve got a serious sweet tooth and need a fast, low calorie alternative to a high calorie dessert. I also love the idea of using this as a finger food recipe to serve at parties and get togethers! The warm berries release so much flavor, and the sweet syrup is such a delicious contrast to the cream cheese. If you are looking to add another tasty dish to your list of Mother’s Day Brunch Recipes this year, this one will not disappoint. A deliously sweet and flavorful WW breakfast or dessert idea, this Strawberry Bruschetts is sure to impress! Rather than indulge in a high calorie dessert, try this palate pleaser instead, for just 5 Points per serving. It’ll make a great addition to your Mother’s Day Breakfast or as a weekday dessert idea. Meanwhile, heat a large skillet over high heat. Add sugar and lemon juice and cook, stirring, until the sugar melts and the mixture begins to bubble, 30 seconds to 1 minute. Add strawberries and stir until juices begin to exude and the berries are heated through, 30 seconds to 1 minute more. Spread 1 tbsp light cream cheese on each piece of toast. Top with the warm berries.